Join us to see the latest innovations and trends on Host connectivity. For years host application users have used the tried and true method of accessing their systems, this means installing a desktop terminal emulation product on the users’ desktop and then forgetting about it until something triggers action. This leads to many implementations being unpatched, unsecured and a maintenance nightmare for corporate IT departments. Businesses today need to be able to ensure that their data is secure and meets all the current security regulations, but still has the business required agility. The traditional “thick client” terminal emulation solution, while still the standard for host access, does not offer a lot of flexibility in terms of modernization strategies and as such can quickly impede an organization's modernization goals. 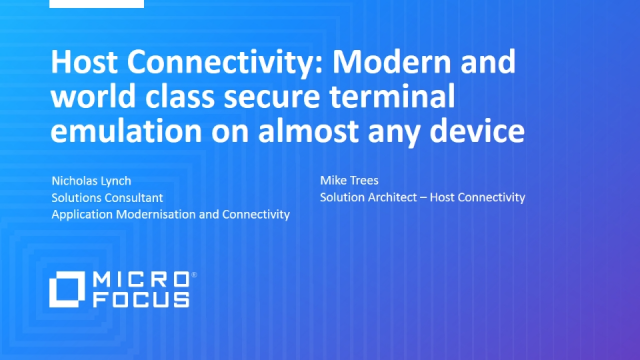 There is an easier and faster, more integrated and secure way with Micro Focus! At the heart of the digital business, the mainframe needs to do so much more than ever before. Connecting, changing and improving to support complex requirements is fraught with challenges and risks. Worse still, IT needs to deliver changes yesterday! How best to approach today's requirements and deliver mainframe-based solutions faster? Our webinar will outline some practical stories from real organizations and how they have employed various modernization strategies to deliver business value, fast. Join us to hear how to unlock and discover the potential of your current applications before you set your development strategy for the 2020’s. Onboard your new generation of developers by using modern tooling to visually map and understand your application from end to end, providing real time knowledge and documentation. Join the one-hour webinar, on 27 February @ 11am ET and hear Forrester analyst Lauren E. Nelson and Micro Focus experts discuss a new Micro Focus-sponsored report from Forrester Consulting, "Exploring the Complexities of Cloud Migration and App Modernization". The report looks at how the global IT industry is managing the complexities of digital transformation. Micro Focus is pleased to announce the forthcoming update of Micro Focus ChangeMan® ZMF 8.2, the leading solution for Software Change, Configuration, and Release Management on z/OS. ChangeMan ZMF 8.2 delivers new capabilities that protects corporate assets and helps mainframe developers get more done in less time. It is a comprehensive system that enables reliable and streamlined software change in a z/OS environment. Join us to hear what’s new in this release. If you are looking to learn more about practical ways to make your mainframe development more agile, then this is the webinar for you! The silos that exist between delivery teams across the business, inadequate tooling, inconsistent processes, delivery bottlenecks – we explore today’s biggest challenges and provide practical solutions for each. Learn how modern development technology and process can improve development efficiency and unify core application delivery. Gain insight into removing common delivery bottlenecks, and discover how to establish a low-cost and powerful continuous integration and unit testing environment. Learn to unify your enterprise application approach while leveraging mainframe and cloud resources and talent. Join us to hear practical steps to Accelerating Mainframe software development - on premise or on the cloud builds upon our recent DevOps webinars: you will see through a live technical demonstration valuable steps on your journey to a more efficient and agile mainframe development environment. The rate of business change is driving organizations to deliver more, faster – and digital transformation is setting the pace. There is much to do. The list includes modernization, continuous integration, automation, cloud adoption and embracing hybrid IT. But successfully adopting the latest trends and technologies depends on an organization’s ability to integrate the right tooling. And for mainframe organizations, that means DevOps. New to mainframe DevOps? Make this Webinar series the first step on your journey to mainframe DevOps. Digital transformation is powering significant change, and your core systems of record are at the heart of delivering this new competitive advantage. 84% of customers report that their COBOL applications and mainframe systems of record are strategic to their business. 74% are planning for application growth. 55% are in the process of modernizing. Join this channel for insights on maximizing the value of these systems.